Place the Bisquick™, milk, and eggs into a blender. Blend for 1 minute, until fluffy and smooth. Cover tightly and place in the fridge. Place the 6 1-tablespoon-sized pats of butter into the bottoms of 6 small ramekins. Set the ramekins on a baking sheet, then place them in the oven. Turn your oven on, preheating it to 400°F while the pans are in the oven. As soon as your oven is preheated, remove the batter from the fridge, blend once more just to ensure it's mixed, then pour it quickly and evenly into the six ramekins (about 1/3 cup of batter per ramekin) then return them immediately to the oven. Bake for 12-15 minutes, or until the top of your hootenanny is puffed and light golden brown around the edges. In a small bowl, mix together the whipped topping and cardamom. Serve hootenanny topped with Cardamom Cream, fresh fruits, and a drizzle of maple syrup. Enjoy! Hooten-whaty? Call them German pancakes, puffed pancakes, or the deliriously silly "hootenanny," but no matter what, this breakfast recipe is dang delish! One of the first recipes I ever learned how to make as a young bride was hootenanny -- pan full of puffed pancake, pulled warm and golden out of the oven, rimmed with the flavor of butter, and topped with a thick drizzle of maple syrup. Is it any wonder my husband adored me? (Wink, wink). Actually, my husband isn't a foodie in the least, and I think he was quite disappointed that when I said I'd was "making hootenanny," it wasn't an early morning frolic, but a delish recipe dish. If you'd like to bake up a batch of hootenanny, we've simplified the traditional recipe even more than ever before by swapping in Bisquick baking mix. This recipe takes four ingredients and less than 30 minutes to make. Here's how to get it rocking beautiful in your own kitchen. Toss a tablespoon of butter into four medium ramekins or small baking dishes. Place them on a baking sheet for convenience. Now, preheat your oven to 400 degrees, and immediately toss your butter-lined ramekins into the cold oven, allowing them to heat up as your oven preheats. You want your dishes as hot as possible. This is part of the science that makes this hootenanny pure kitchen magic. Hot dish, cold batter, equals puffy deliciousness. Now mix up your batter by grabbing some Bisquick, eggs, and milk. Yep. That's literally all you need. How easy is this recipe? Toss all the batter ingredients into a blender and puree for 1 minute. Then, cover tightly and toss into your fridge, just to make sure your batter is niiiiiice and coooooold. The minute your oven is preheated, the butter should be sizzling in your ramekins. Pull them out of the oven quickly. Pour the batter right into your ramekins. Pop into the oven and bake until golden brown and puffy. Cut slices of your favorite fruits. 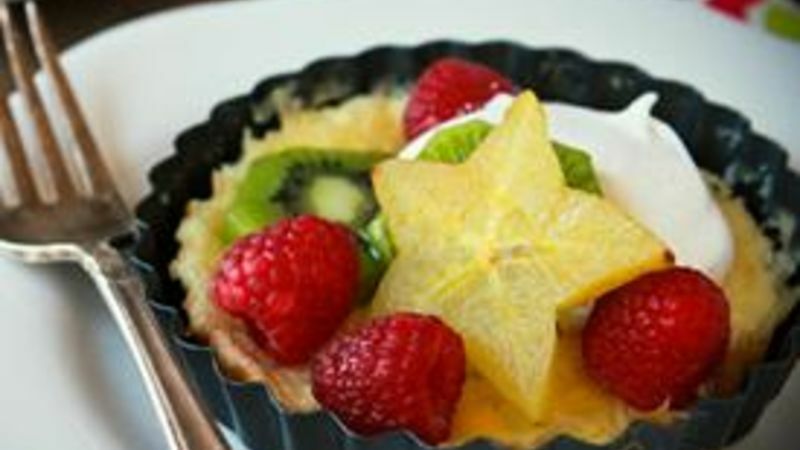 We love kiwi, starfruit, and raspberries for their bright colors and fresh flavors. Pull your hootenanny out of the oven. Here's a little secret about this recipe: sometimes it works, sometimes it doesn't. This photo above what I like to call a medium-awesome hootenanny. It rose and puffed a bit, got a crisp buttery edge all baked up around it's edges, but the sides of this batch didn't rise up the edges of my baking dishes. To increase your odds of baking awesome-fabulous hootenanny, use deep-sided ramekins, and make SURE your butter and pans are sizzling hot before you pour a chilly batter inside. It's always fun when you get a batch that rises up the edges of the pan, but don't fear if you get a flat or medium-flat version of this recipe. It still tastes like a charm. Especially when you serve it for breakfast. Especially when it's topped with fresh fruit and cream and a nice bit of maple syrup. Have you ever made a puff pancake before? Tell us about it!